Regis Philbin, Marv Albert, Natalie Cole. Kevin Nealon, Outkast, Joe Pantoliano. Bob Dole, Elizabeth Dole, Joaquin Phoenix. How many episodes of Late Show with David Letterman have you seen? Pat Farmer: Do you like her? Jeff: Yeah, but someone should tell her to lay off the donuts. Q: Why is it always daytime during the outdoor scenes? 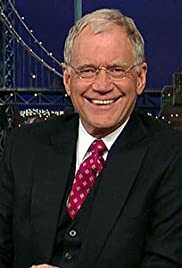 "Late show with David Letterman" is in many ways superior to other talk shows in late night television. 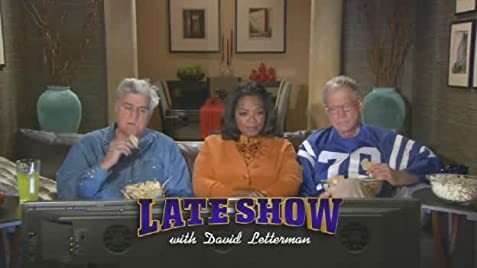 Even if Letterman is the main focus, and often tends to act a bit egocentric, he still (or perhaps it`s more correct to say that the writing does) includes many of the crew members in the sketches. This gives the show an excellent flavour of diversity, and make it even more outrageous and entertaining. The writing is very original and innovative, and is able to grasp with current events in a clever, and at the same time, plain crazy way that will make you burst out in laughter. But of course, the most important person is Dave himself, a highly individual host with his own, unique style. He is by all due respect not a very good stand up comedian, and might sometimes seem quite uncomfortable delivering his jokes in the opening monologue, but he is well aware that this is not his strength, and keep it to a minimum, 3 or 4 minutes (as a comparison, Jay Leno`s monologues last for 10 minutes) Also considered harsh, sarcastic and unpredictable, Letterman is not loved by everyone, and these traits might sometimes make him a bit unhuman, but at the same time, his unpredictability is also his genius, and what makes him stand out from his fellowships. The music director Paul Shaffer plays a major part in the show, and functions as Lettermans sidekick with his funny, and some times not very well thought comments(and yes, i agree, he sometimes looks as a parody in his flamboyant suits) Their relationship is extremely established, and their chemistry is also fabulous, so it`s unthinkable to imagine anyone else as the music director. So, if you wan`t to watch a very special and imaginative talk show with a touch of pure genius, "The late show" is the right vehicle. And if you haven`t become a regular viewer yet, you better hurry up, because it`s hard to say for how long David will keep going. By all means, im not a prophet, but i will guarantee you that David Letterman is too unique to be replaced. Watch the show regularly, and you will understand what i mean.